As with the last post I wrote, this one is rooted in a Facebook discussion/argument between members of the Recomposition editorial collective. Mostly between Nate Hawthorne, Scott Nappalos and Adam Weaver, but including others from some of the A New World In Our Hearts organizations. I didn't catch all of it, so I could possibly be missing some elements and perspectives, but the topic seemed to revolve around the language we use in propaganda. The debate apparently started over an image someone made of what I believe were student protests in Chile. 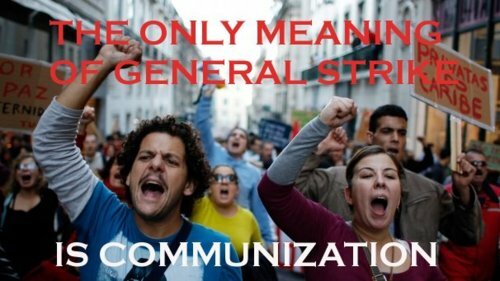 The text on the image read "The Only Meaning of General Strike is Communization". Whether the image was intended as public propaganda or merely playing around on Photoshop, I'm not sure, but it sparked a discussion about how almost nobody knows what that term means and that we shouldn't get into the habit of using language most people won't understand. 1)There is a supposed general baseline on what propaganda resonates with people. 2)Propaganda aimed at our circles is a waste of time. 3)We do not have the ability to define words and ideas. Undoubtedly, the term 'communization' is not something even completely defined with the small amount of people that use it, hence a 300+ page book, mostly consisting of debates revolving around the meaning. So while there is a point on not using that term, I think the term 'general strike' is also almost as vague and unfamiliar, and in any case, there is something to be said on our ability to define words the way we like in this vacuum and see them catch on (more on this later). I think it's tough to really know what will resonate with people. Often times, a mythical, nonexistent 'regular worker' is used as the measuring stick for what we should say and how we should say it. To a certain extent, this makes sense: a lot of the language of the radical left sounds completely alien within the context of American political discourse. There is also the ever present problem of inward looking radical 'communities' that have their own social norms and language that can differ widely from other social groups (including ones individuals from these radical "communities" are ostensibly a part of). However, this 'regular worker' does not actually exist. Working class people vary widely in their interests, educational backgrounds, and understanding of specialized political and economic terms. That doesn't mean there aren't bad ideas when it comes to public agitation though. The Stalinist sect, with their newspaper headline screaming "DEFEND THE DEFORMED WORKERS' STATE OF NORTH KOREA" seems clueless if their newspaper is for random general consumption on the street (to say nothing of the revolting position this slogan reveals). Similarly, a call for an "unlimited wild general strike" in Wisconsin earlier this year when people were having enough difficulty even understanding the concept of the much simpler - and less wordier - 'general strike' also seems of limited use for on the street results. Most good organizers will tell you that a bad - but common - way or organizing is going to everyone and telling them your issue and getting them to agree that this is their issue, too. Most are not moved this way. Instead, finding out people's different issues, tying them together and relating them to solutions and ideas is more constructive. A smiliar approach should be adopted with propaganda. Another bad organizing move (for revolutionaries) is telling people what their issue is by using a lowest common denominator approach. Basically, watering down your message to the point where you have now created a general baseline. But, this approach is not about meeting people where they are at (a worthwhile goal), it now becomes assumptions about whether they can be met at all. It is both presumptuous and negatively determines the potential of your efforts. So what's the baseline? Is there one? I would say it's difficult to pinpoint and there probably really isn't a general one. However, there are baselines for more specific social groups. For instance, propaganda that resonates with precariously employed undocumented immigrants is going to differ from graduate students with citizenship. Single mothers will not necessarily find the same inspiration in a flyer or text that retirees will. And so on. Notice that "people on the periphery of our circles" or even "we" are excluded from the above examples. Most of the time, it seems, propaganda is seen as meant solely for that vague general baseline and for no one else. People on the edge of our tendencies or even we ourselves, do not need material aimed at us, as if we are somehow immune to the effects that we are convinced work on others. I think this is false and an area where insurrectionary anarchists get partially right. They recognize the power of in-group propaganda to motivate their base and keep spirits high and utilize it in exactly that fashion. The stoic, robot-like militant caricature which the Situationists critiqued decades ago is not something to be emulated. We still need to be inspired. We need to laugh. We need to be reminded that what we're doing is not a waste, but part of something larger. On the flipside though, insurrectionary anarchists tend to direct most of their propaganda to their own, which is not something I would advocate. I am simply recognizing that people already involved in revolutionary unions, political organizations and projects also need propaganda aimed at them. Personally, groups like the Deterritorial Support Group or WSA-SoCalseem to be good examples of some of ingroup propaganda. Even as an IWW militant fully convinced already, their propaganda inspires me and gets me excited about what I'm doing. This is just something that is necessary. In a small but valuable way, it keeps me determined. Mere words and graphics that can accomplish such a thing should not be taken lightly. The third and last point this discussion brought up for me was the lack of confidence that exists among some folks in our ability to define our language and communicate ideas. This lack of confidence is somewhat understandable. Most of our experience has come during a low point of class struggle. A certain type of cautious conservatism can manifest because of this. In Madison, a couple of socialist sects called the IWW's call for a general strike 'premature' or 'irresponsible'. While this was probably motivated by being outflanked on the left, this also has to do with thinking 'the masses aren't ready'. And while a general strike did not end up happening, the simple fact that it resonated with so many people shows there are new possibilities. The events in Oakland have proven this even more. Most also would not have imagined that a mass movement would have emerged that used the same language (and some of the same tactics) of "Occupy Everything, Demand Nothing" that exploded from the insurrectionary tendencies in the student movement two years ago. In fact, some "anarchists" were so aggrevated and angry about this tendency that they wrote an open letter, more or less siding with the accounts of authoritarian groups. I don't believe this was just based on one or two specific incidents of questionable behavior by individuals, as was claimed. The open letter was a hit piece that took on a tendency that some felt uneasiness with because it refused a lowest common denominator approach. Bringing this up again isn't because I feel the need to retroactively condemn what happened, but rather, it is an example of how a lack of confidence in our ability to define our words and ideas leads to an uneasiness towards those who refuse to sugarcoat them, which can lead to a sort of 'movement managerial' role, where self-identified anarchists pit themselves against others who largely share their general politics. This is unfortunate and should be avoided.